Jaipur : To mark the first anniversary of the launch of Pradhan Mantri Matru Vandana Yojana, State level Concluding Ceremony for Matru Vandana Saptah, with support from UNICEF was organized under the chairmanship of the Minister of Women and Child Development, Rajasthan, Anita Bhadel on Monday at the Rajasthan Agricultural Research Institute, Durgapura. Dr Vinod Kumar Paul, Member, NITI Aayog was invited as a Special Guest at the event. The participants at the workshop included Deputy Directors, Child Development and Project Officers, Supervisors and Anganwadi Workers and Helpers. Under the scheme, more than 5 lakh beneficiaries have been enrolled and Rs 128 crores have been disbursed so far for close to 8.5 lakhs applications. Rajasthan’s performance has received national recognition, and the Ministry of Women and Child Development has presented ICDS, Rajasthan with a Certificate of Appreciation at the National Concluding Ceremony for Matru Vandana Saptah held in Dehradun on 7th September 2018. Top five districts awarded at the event are Hanumangarh, Sri Ganganagar, Jhalawar, Jhunjhunu and Sikar. Top performing Child Development and Protection Officers and Lady Supervisors from each district were awarded. 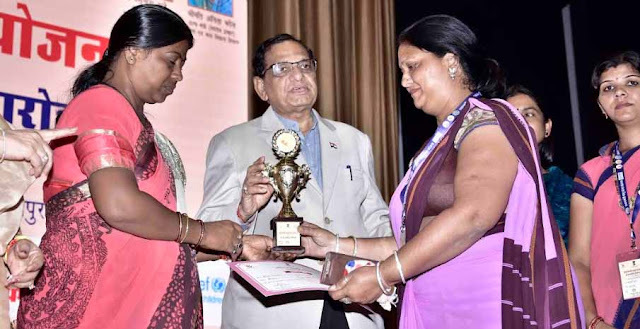 Additionally, top performing Anganwadi Workers and Helpers from each of the seven administrative divisions were awarded at the event.